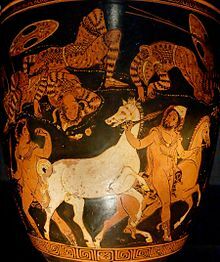 Odysseus and Diomedes stealing Rhesus' horses, red-figure situla by the Lycurgus Painter, ca. 360 BC. Rhesus (Greek: Ῥῆσος, Rhēsos) is an Athenian tragedy that belongs to the transmitted plays of Euripides. Its authorship has been disputed since antiquity, and the issue has invested modern scholarship since the 17th century when the play's authenticity was challenged, first by Joseph Scaliger and subsequently by others, partly on aesthetic grounds and partly on peculiarities in the play's vocabulary, style and technique. The conventional attribution to Euripides remains controversial. Rhesus takes place during the Trojan War, on the night when Odysseus and Diomedes sneak into the Trojan camp. The same event is narrated in book 10 of Homer's epic poem, the Iliad. In the middle of the night Trojan guards on the lookout for suspicious enemy activity sight bright fires in the Greek camp. They promptly inform Hector, who almost issues a general call to arms before Aeneas makes him see how ill-advised this would be. Their best bet, Aeneas argues, would be to send someone to spy on the Greek camp and see what the enemy is up to. Dolon volunteers to spy on the Greeks in exchange for Achilles's horses when the war is won. Hector accepts the deal and sends him out. Dolon leaves wearing the skin of a wolf, and plans on deceiving the Greeks by walking on all fours. Rhesus, the neighboring king of Thrace, arrives to assist the Trojans soon after Dolon sets out. Hector berates him for coming so many years late, but decides better late than never. Rhesus says he intended on coming in the beginning, but was sidetracked defending his own land from an attack by Scythians. Meanwhile, on their way into the Trojan encampment, Odysseus and Diomedes run into Dolon and kill him. When they reach the encampment with the intention of killing Hector, Athena guides them to Rhesus' sleeping quarters instead, pointing out that they are not destined to kill Hector. Diomedes slays Rhesus and others while Odysseus takes his prized horses before making their escape. Rumors spread from Rhesus' men that it was an inside job, and that Hector was responsible. Hector arrives to cast blame on the sentinels for, due to the sly tactics, the guilty party could only be Odysseus. The mother of Rhesus, one of the nine muses, then arrives and lays blame on all those responsible: Odysseus, Diomedes, and Athena. She also announces the imminent resurrection of Rhesus, who will become immortal but will be sent to live in a cave. This short play is most notable in comparison with the Iliad. The part with Dolon is pushed to the background, and much more is revealed about Rhesus and the reactions of the Trojans to his murder. The first to fully dispute that the Rhesus was a play by Euripides was L. C. Valckenaer in his Phoenissae (1755) and Diatribe in Euripidis deperditorum dramatum reliquias (1767). In an introduction to Rhesus, classical scholar Gilbert Murray wrote that passages from the play were quoted by early Alexandrian writers. The ancient hypotheses transmitted along with the play, however, show that its authenticity was attacked by a number of scholars whose names are not given. Cases against Euripides' authorship generally center on stylistic differences. Murray argued that this may be attributable simply to a younger or less-developed Euripides. Murray also raised the possibility of its being a reproduction of a Euripides play, perhaps undergone by a contemporary or by Euripides' son. Professor Edith Hall argued in an introduction that modern readers "will be struck in particular by the un-Euripidean lack of interest in women," and noted Euripides' son having borne the tragedian's name, as an argument against the conventional attribution. In 1964, William Ritchie defended the play's authenticity in a book-length study. His conclusions were opposed, however, by Eduard Fraenkel. Before Ritchie, Richmond Lattimore had also stated that the Rhesus had been written by Euripides, probably at some point before 440 BC. Professor and translator Michael Walton has claimed that modern scholarship agrees with the classical authorities in ascribing the play to Euripides, but admitted in a successive work that the attribution is still disputed by a number of scholars. ^ B. M. W. Knox, "Minor Tragedians", pp. 87–93, in P. E. Easterling & B. M. W. Knox (eds. ), The Cambridge History of Classical Literature, vol. I: Greek Literature, CUP, Cambridge, 1989, pp. 90–91. ^ a b W. Ritchie, The Authenticity of the Rhesus of Euripides, CUP, Cambridge, 1964, ISBN 9780521060936, p. vii. ^ See Ancient History Sourcebook. ^ See his introduction to Rhesus. ^ Hall, 2008, p. xxv-xxvi: "Euripides was widely imitated by other tragedians, and others bore his name, including his own youngest son, who was responsible for the posthumous production of Iphigenia at Aulis and Bacchae. The prevalent scholarly view holds therefore that Rhesus is the work of an unidentifiable playwright active in the fourth century BCE (when there was a revival of interest in dramatizing themes from the Iliad), and as such it is a unique document, since all other Greek tragedies date from the century before." ^ Lattimore, Richmond. "Introduction to Rhesus," by Euripides. From Euripides IV, edited by David Grene and Richmond Lattimore. Chicago: University of Chicago Press, 1958. p. 5. Hall, Edith. 2008. Introduction. In Bacchae and Other Plays, Oxford World's Classics. ISBN 0199540527. Walton, J. Michael. 1997. Introduction. In Plays VI. By Euripides. Methuen Classical Greek Dramatists ser. London: Methuen. vii–xxii. ISBN 0-413-71650-3. Walton, J. Michael, Euripides Our Contemporary, University of California Press, 2009, ISBN 0520261798. This page was last edited on 14 June 2018, at 19:56 (UTC).